It’s summer time, whatever that means in England, and as such I’d like to offer you these easy and delicious recipe ideas for a few of my favourite wild edibles, in season right now. I’m quite a lazy cook, preferring to take the most direct road to Flavour Central rather than wandering all over the place on route. “Do you have some good mushroom recipes ?” I am often asked on my New Forest Fungi walks…”FRY THEM” I reply, if the taste is already there I’m keen to do as little as possible to interfere with it and not delay it’s inevitable journey into my mouth any longer than needed. So, with this philosophy in mind, I hope you enjoy the ideas below and that the sheer simplicity of them leaves you no excuses when it comes to making them yourselves and letting me know how you got on. Arriving late this year, but finally here, these heady blooms are easy to ID by their big white sprays and wonderful aroma (do not pick Rowan or Dog wood by mistake..both have very different leaves but superficially similar flowers). Put a dozen good sprays of elderflower in a big jug or bowl, fill it with cold water, cut a lemon in half and squeeze in the juice, chuck the squeezed halves in for good measure and add a splash of cider vinegar and some sugar, perhaps four to eight table spoons to a litre of water (to taste, as they say ). That’s it. Leave it in the fridge for 24 hours and then serve it to friends pretending it’s a complicated and secret recipe. Absolute heaven in a glass. 2. Wild Spinach Aloo (nettles are great in this recipe too). A simple and delicious curry for which you can use any of the seasonal spinach lookalikes ( Fat Hen, Good King Henry, Spear leaved Orache and various others are all starting to flourish about now….Sea beet is great too if your near the coast), avoiding any suspect members of the potato family, woody nightshade in particular. Cube 2 large potatoes and boil until they are almost cooked through (but not falling apart), then heat some oil in a large pan, add the potatoes and mix in a couple of cloves of chopped garlic (or any wild version if you have it). Also add half a teaspoon of cumin, turmeric, chilli powder, garam masala and mustard seeds ( or an approximation of these depending what spices come to hand). When the potatoes get a bit crispy, add a chopped tomato or two and cook for a couple more minutes. Lastly take half a carrier bag of your prefered greenery, much less if using Sea beet as it hardly reduces when cooked, and heat it until wilted. Add a bit of water if needed (the potatoes should drink up any excess fluid) and a splash of soy will pull the whole dish together. Serves two but I’d easily eat the lot on my own. 3. Lime Leaf and Oxeye Daisy Salad. This is my absolute favourite summer salad and has only two main ingredients, but obviously you can add whatever you like once you have discovered the joy of these tasty leaves and flowers. Oxeye daisy; London parks have plenty of the cultivated variety and the countryside is brimming with the wild version. Both are in full flower right now, with delicious fruity leaves and yummy scented flowers. Look for great big daisies about 2-3 ft high with yellow and white flowers ( DO NOT eat any with just yellow flowers as this is poisonous Ragwort). 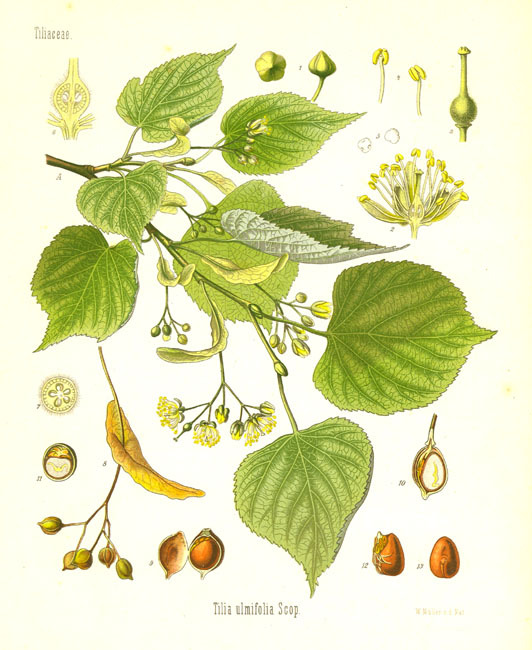 Lime leaves are the heart shaped foliage of the Common Lime tree ( Tilia cordata) found in abundance in every London park, brimming with numerous medicinal properties and also containing Mucilage (the slimy stuff in Okra). Pick young, slightly translucent new growth leaves but try munching a few bigger ones and then decide which suits you best. The blossoms have the wonderful taste of honeydew melon, so get some of them too ( dried , the blossom make the best tasting of all the herbal teas). Very easy to ID right now with it’s big cordate ( heart shaped) leaves that cover the entire trunk right down to the ground and distinctive honey smelling white blossoms. So, the recipe….combine the leaves and flowers of both plants and add some olive oil and either a splash of lemon juice or some salt or both. Half the time, mine don’t even make it home. 4. Killer Cherry Pie ( Twin Peaks Style). I love cherries (who doesn’t), but my preferred way of consuming them is just to eat them by the handful and spit the pips out as I go. Perhaps one day I will make it to the annual cherry stone spitting championship in Michigan. Southern England has masses of Cherry trees and the London parks also have plenty, although I often see people damaging these trees in an attempt to get a few extra berries so I’d suggest that if anyone is that desperate they just buy them from their local shop. Anyway, here’s a simple and tasty pie recipe. I use pre made short crust pastry but obviously your welcome to make your own. Roll the pastry out to about 3mm and use it to line a 20cm (ish) pie dish. Add about a kilo of pitted cherries and sprinkle with some icing sugar if a lot of them taste sharp or you have a very sweet tooth. Wet the edges of the dish and add more pastry to make a lid (do something fancy with lattice work if your in the mood), then press the edges with a fork to make a good seal and a nice pattern. Bake in a preheated oven at200C/gas mark 6 for twenty minutes. Serve with custard and an episode of your favourite late eighties surrealist TV show. 5. Yarrow and Fennel Tea. Let’s be honest, generally when a book describes a plant’s best use as “making a great tea”, it means it’s rather dull and has no other merit. Not so for these two amazing tasting herbs; packed with flavour and numerous medicinal and culinary benefits. Yarrow stimulates the appetite, aids digestion and helps suppress colds and fevers. Fennel is one of nature’s best calmatives as well as containing Anethole, a powerful antimicrobial and anti fungal; both are diuretic, so help to purge toxins from the body. Combined they make my favourite of all the herbal teas and are both easy to ID, mature fennel with it’s tall blueish stem, yellow umbilifer flowers and distinctive sweet smell and yarrow with it’s low clumps of single feather like leaves. Links below to help. 6. Nettle Beer (natures own high explosive). This is the perfect drink for students or anyone on a budget and desperate to get drinking as quickly as possible. Ready to consume in just a week from picking, nettle beer always sounded to me like a nasty concoction my Dad might have forced upon us in the 70’s. How wrong I was; this amazing brew tastes like a cross between a wonderful rustic cider and an old style ale or sweet wine. I’m never sure how alcoholic it is; I have a hydrometer but rarely bother with anything so specific in any of my recipes. Nettles are a great “cut and come again” plant so if your local patch has got much too tall and the nettle tips too robust (and full of gritty crystals) you can cut them down and come back for the delicious new growth a couple of weeks later. 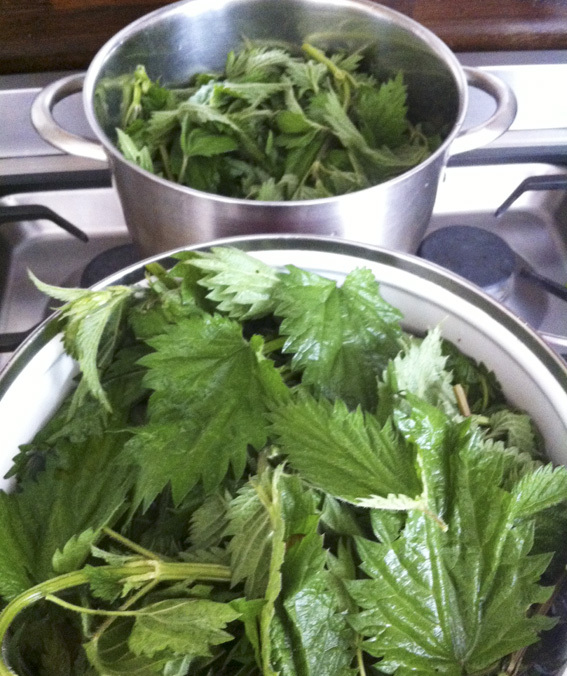 Take about 50 nettle tops (roughly the top 6 to 8 inches), picked using rubber gloves and some good scissors, then wash and add to 6 litres of water (usually in two pans unless you have on huge one). Bring to the boil and simmer for 15-20 minutes before removing the nettles ( eat them as a veg or use to make a life time supply of pesto) and adding 500 grams of sugar and 25 grams of cream of tartar powder. Stir until the sugar dissolves and then let the liquid cool to tepid before mixing in 8 grams of brewers yeast, then leave, in a sterilised bucket with muslin over the top, for a few days before syphoning into sterilised bottles ( if you have not done any syphoning before, this is the fun bit and just requires a bit of plastic tube..look on youtube for demos but ignore most of what they say, it’s really simple). I usually leave it for three days but I have read of people leaving it up to two weeks…basically you need to let the first fermentation stage do it’s thing or your bottles will explode in dramatic fashion. 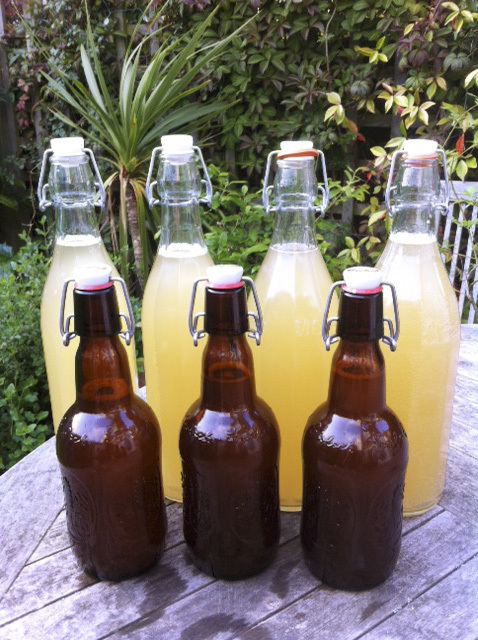 There are loads of recipes on the internet to mix and match ideas to get the best result and taste ( I have read of people adding lots of grated fresh ginger which sounds terrific as nettle beer does taste a bit like a ginger beer too). This makes about a dozen normal sized bottles. To work out how alcoholic it is you could try drinking it all in one go and then compare this experience to drinking 12 shop bought beers. Takes notes though, this is serious scientific research! You know me John, a bit rough and ready when not teaching. Forgive the coarseness. I’ve picked my elderflowers for ‘champagne’ today but reading this post I’m wishing I’d not sprayed the allotment nettles with weedkiller! Next post: Tales from the riverside (six more, simple, summer recipes). Previous post: My foraging heroes.